As we move deeper and deeper into spring, more birds are starting to arrive at my favorite marshland, Huntley Meadows Park. Last weekend I spotted my first Tree Swallow (Tachycineta bicolor) of the year. Actually I had spotted a few of them a bit earlier zipping around the sky, but this was the first one that I saw perched on the ground. The Tree Swallows seem to enjoy using the nesting boxes scattered throughout the park and this one was checking out one of the boxes. I was happy also to be able to get a shot of the swallow perched in a tree—despite their names, I rarely see Tree Swallows in the trees. 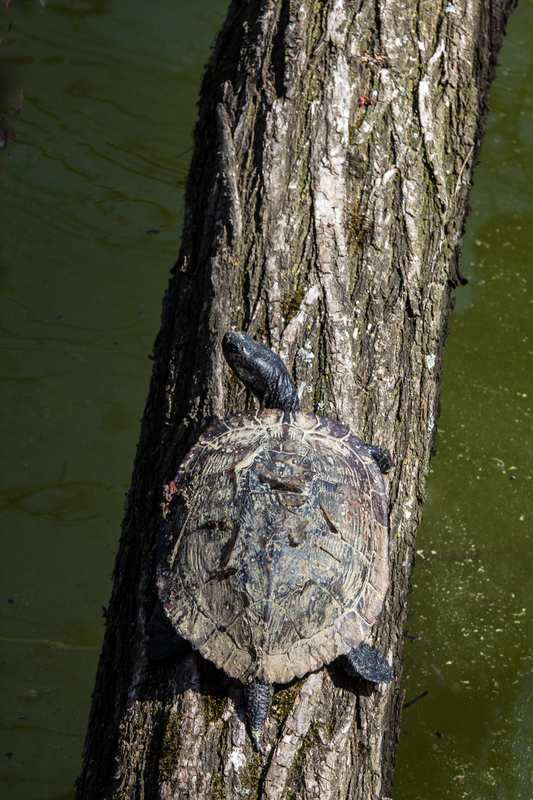 Normally I see turtles at water level, but this intrepid turtle had climbed up the trunk of an overhanging tree at Jackson Miles Abbott Wetlands Refuge on Monday and was perched several feet about the surface of the pond. I love the way that his coloration and texture almost perfectly match those of the tree. 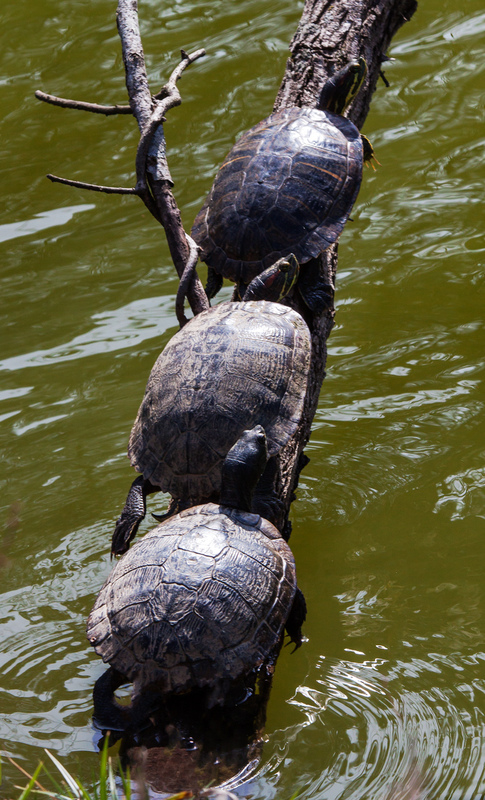 A short while later I encountered three turtles perched on the trunk of a tree growing at an angle out of the water. The angle was steep enough that I was not sure how they managed to get themselves into position or how they were able to keep from sliding down into the water. 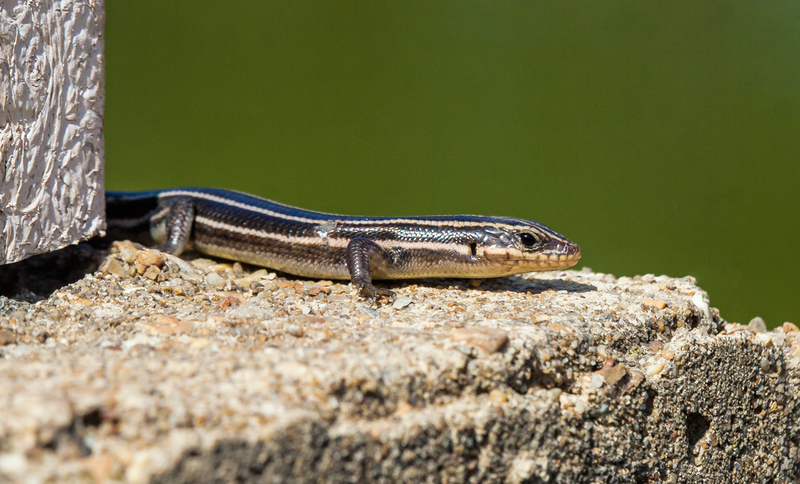 A warm, sunny springtime day caused all kinds of creatures to appear, including this Common Five-lined Skink (Plestiodon fasciatus) that I spotted on a concrete fishing platform at Jackson Miles Abbott Wetlands Refuge in Alexandria, Virginia. 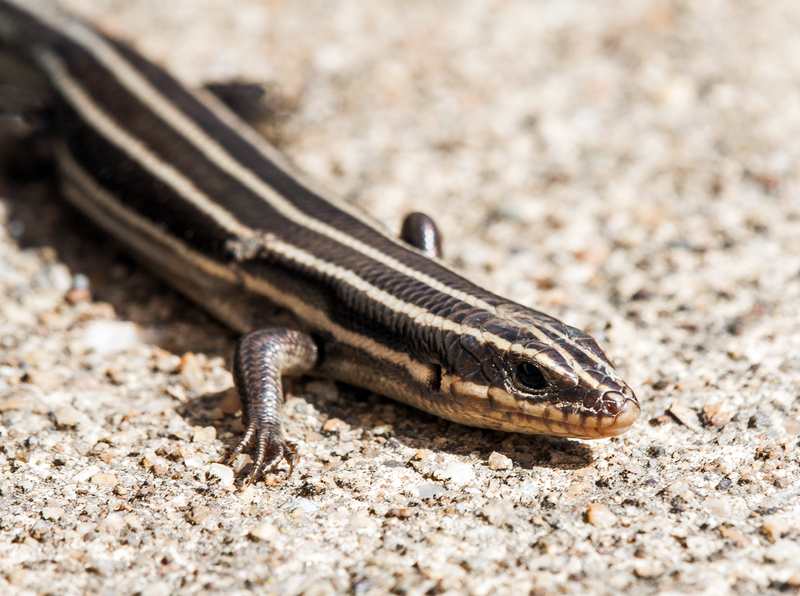 This variety of skinks is one of the few lizards in the area in which I live and the skinks tend to be elusive and skittish, so I generally see only the tail of the skink as it is running away. 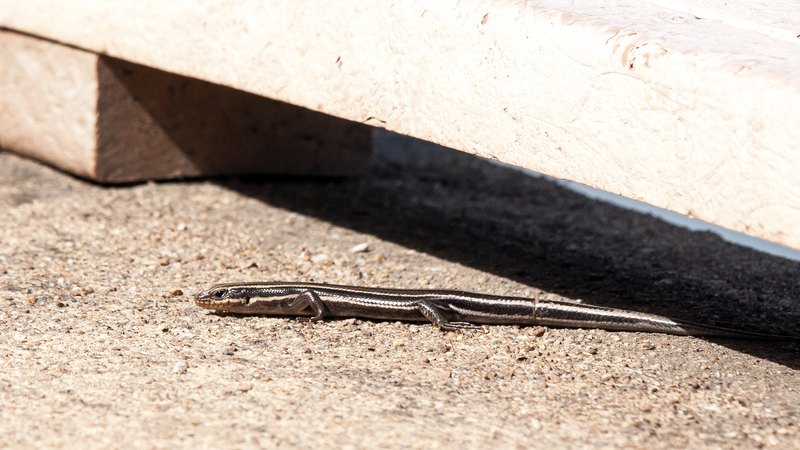 This skink and I engaged in a protracted game of hide-and-seek as I sought to get close enough for some shots. Although I would have been a bit happier with a more natural backdrop, I am relatively content with the images that I was able to capture. Do bees drink water? As I was investigating the ponds at Green Spring Gardens again yesterday for signs of dragonflies, I spotted some bees landing in the shallow water. It looked like they were getting drinks of water, but I wondered if it was possible that they were somehow gathering nectar and/or pollen. I did a little research and found out that bees do in fact drink water. 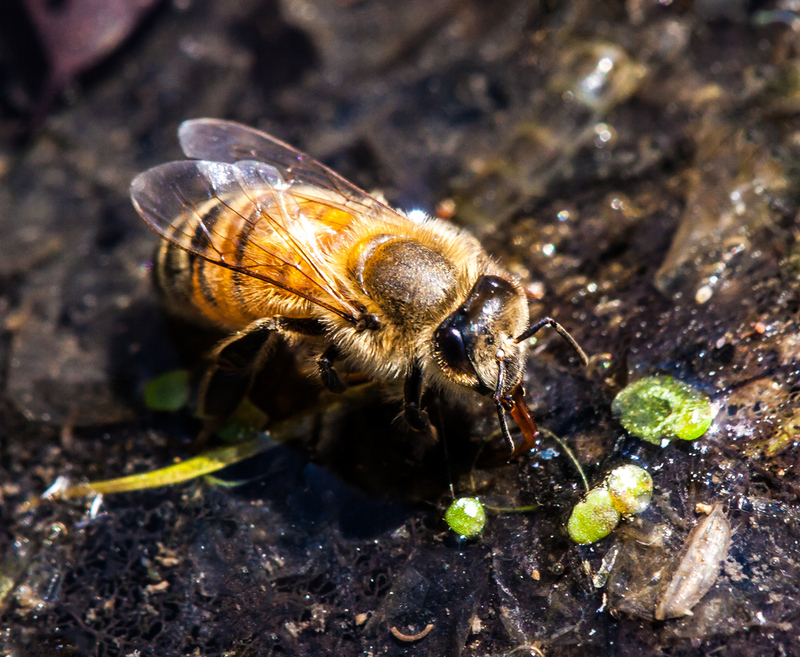 One article at honeybeesuite.com described some of the reasons why bees bring water back to the hive. 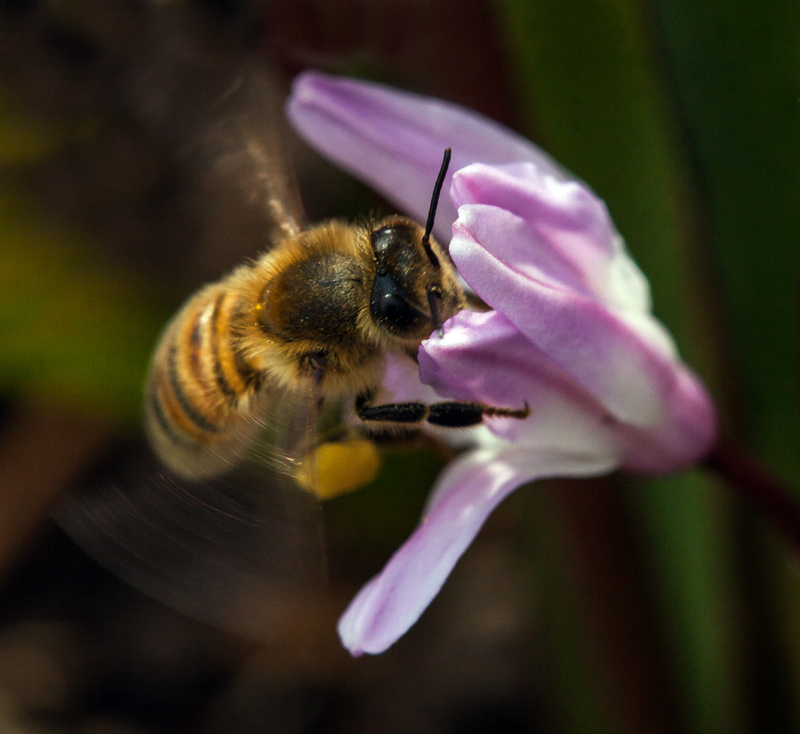 It also noted that, “Bees seem to prefer water that has some growth in it—such as green slime—rather than perfectly clean water.” and speculated that the bees can smell the growth and recognize it as a water source. That was certainly the case at the pond yesterday, where the water had all kinds of green gunk growing on it. 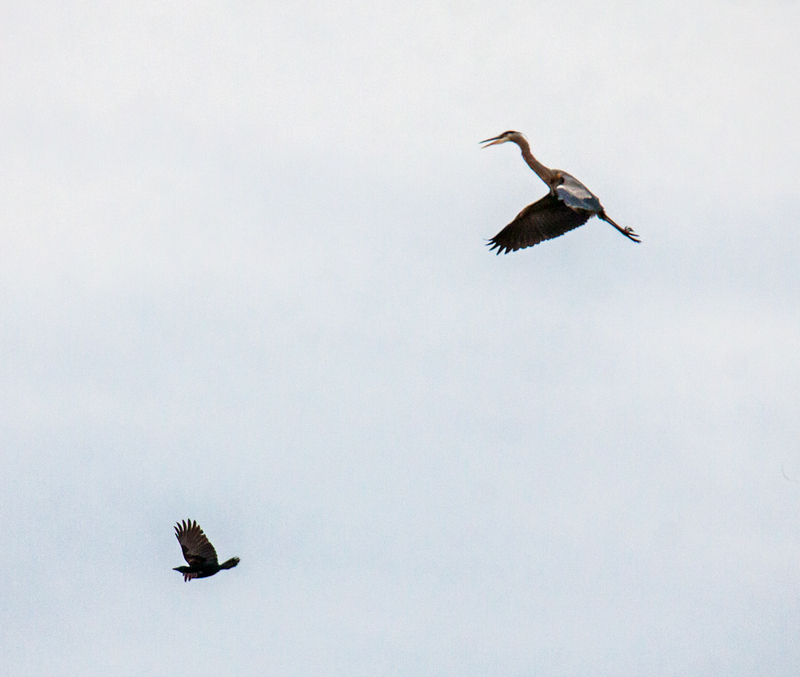 I’ve seen crows harassing hawks and eagles, but I’d never seen a crow being chased off by another bird until this past Friday at Huntley Meadows Park, when I witnessed a Great Blue Heron (Ardea herodias) flying after what appeared to be a crow. 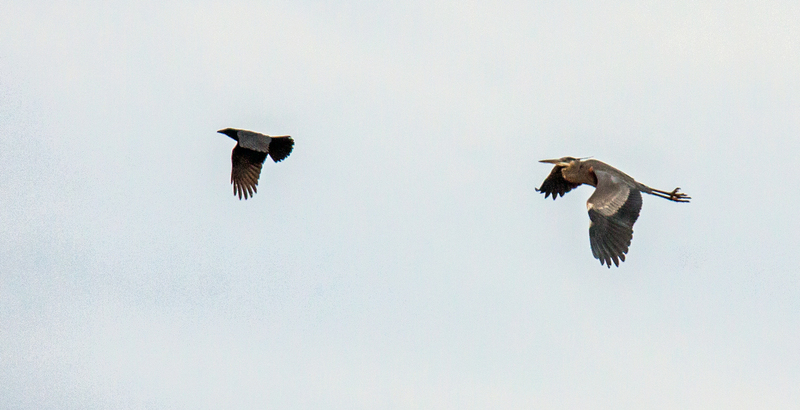 After the heron caught up and forced the crow to depart, the heron appeared to be squawking a few words of warning not to return. 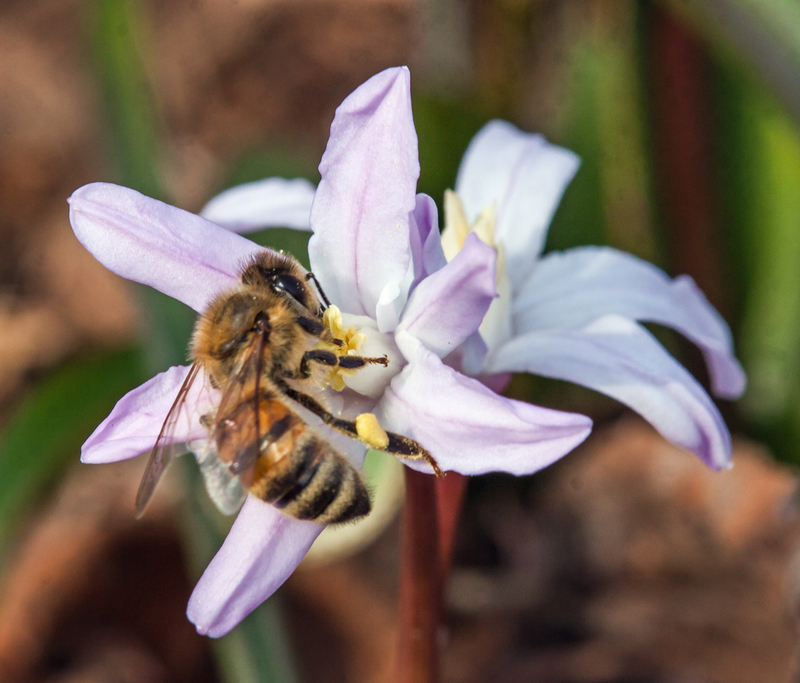 It’s still a little too early for dragonflies, but I did find some cool little bees yesterday afternoon at Green Spring Gardens in Alexandria, Virginia, a county-run historical garden not far from where I live. Longtime readers of the blog know that I love taking macro photographs and during summer months my trusty Tamron 180mm macro lens is on my camera most of the time. Yesterday I decided to dust off my macro lens and search for insects. For most of the afternoon I came up empty-handed, but then I spotted a few bees gathering pollen. They kind of look like honey bees, but I don’t remember honey bees being that small. 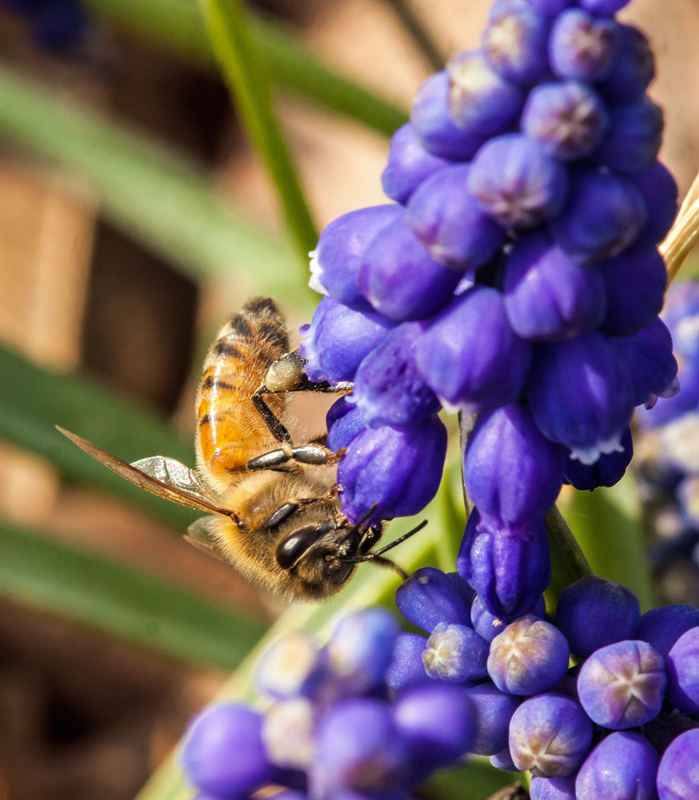 Grape Hyacinths (g. Muscari) are only a couple of inches tall and the first photo gives you an idea of the size of the bees. Spring is finally here and I look for an explosion of insects soon. During this transitional time of the year I expect to be switching back and forth between my telephoto zoom lens, primarily for birds, and my macro lens, primarily for flowers and insects. 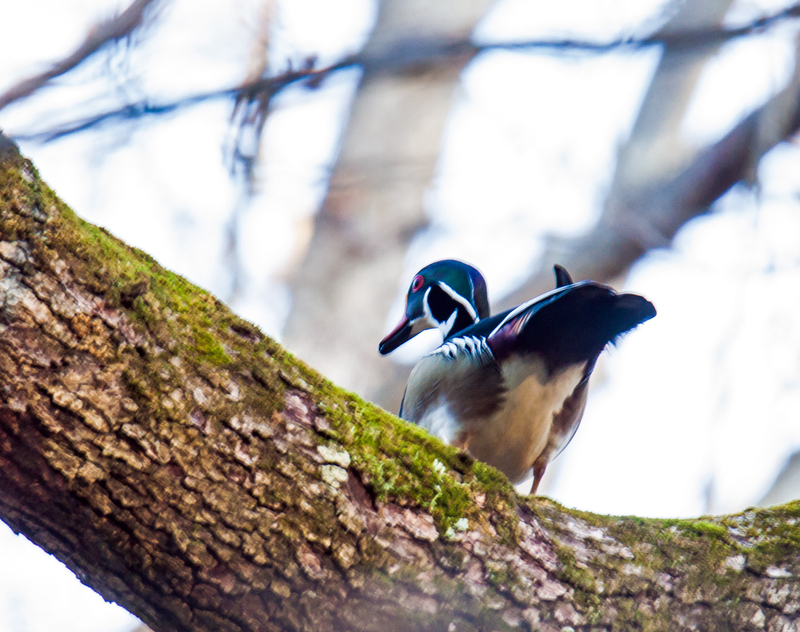 As I was making my way to the start of the boardwalk at Huntley Meadows Park early on Monday morning, a helpful birder pointed through the trees to a pair of Wood Ducks (Aix sponsa) that appeared to be seeking a nesting cavity. 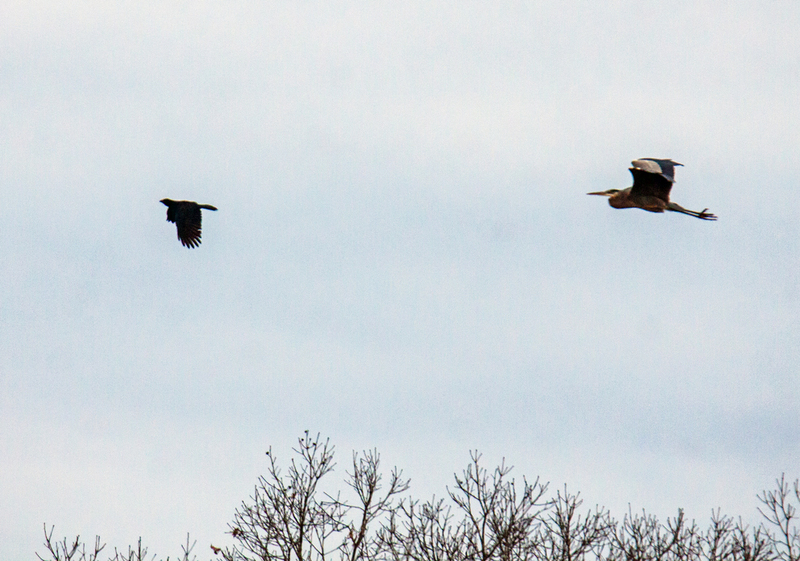 The female kept moving among the trees, but the male stayed still for a moment and let me get this long-distance shot. It’s pretty unusual to see ducks in a tree and generally I know they are in the trees only when I hear them flying away. The Cornell Lab of Ornithology website notes that Wood Ducks “are one of the few duck species equipped with strong claws that can grip bark and perch on branches.” This spring I have noted Wood Ducks checking out nesting boxes at the park, but perhaps this couple prefers a more natural birthing experience (or maybe all of the nesting boxes are being used by other Wood Ducks or Hooded Mergansers).